Read here about the use of tensegrity structures in connection with holidays such as Christmas and Sukkoth (Tabernacles). As tensegrity becomes more mainstream, it becomes associated with holiday events where tensegrity structures are used. This article collects examples of tensegrity structures whose designers or makers connect the tensegrity to a holiday tradition. Tensegrity structures sometimes feature in people's tree decorations or gift giving. Alejandro Erickson posted a recipe for making tensegirty christmas tree decorations. In his film on guerilla geometry, he creates and then tests these constructions by hanging them on a fir tree in a public part (see photo at the start of this post). [[file:6 strut christmas decoration on tree from Alejandro Erickson video2.png|thumb|500px|none|Erickson decorating a fir tree with tensegrity Christmas decorations, or 'tensorections'. Still from video by Erickson." [[file:vlcsnap-2014-10-07-08h46m41s216.png|thumb|500px|none|Erickson constructing a 6 strut Christmas tree decoration. Still from video by Erickson, posted to the Instructables site. " The sukka, a temporary outdoor dwelling, is constructed annually by practicing Jewish people during the Festival of Booths, or Tabernacles. An autumn celebration, the holiday and its dwelling have many religious and mystical associations. Celebrated on the 15th day of the month of Tishrei (varies from late September to late October), it is one of the Three Pilgrimage Festivals (shalosh regalim) that commemorate days when the Israelites made pilgrimage to the Temple in Jerusalem. Tensgrity is sometimes used to structure a booth. Note that such structures must meet both tensegrity and traditional Jewish requirements regarding the structure, number of walls and porosity of the roof. Tensegrity structures are also sometimes hung in the booths as decorations. Lulav Hut was a proposal for a sukkah shelter designed in collaboration with Keltie McLaren for the 2014 Sukkahville competition. 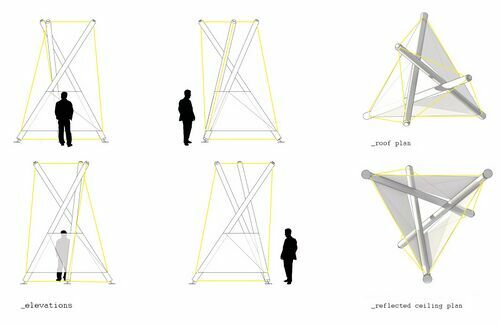 Inspired by the three branches of the lulav and the urgency with which the original sukkah shelters were built, the proposal was for an efficient tensegrity structure of common lightweight materials that is quick and easy to assemble. Upon entering the hut through a zippered opening in its paper enclosure, participants are invited to rest at one of three small stools that employ the same structural principles as the shelter. At night, the lulav lights up from within and serves as a beacon. A lantern hung from the center of the hut illuminates and brings warmth to the translucent oiled paper covering of the shelter, while small punctures in the cardboard tubing, recalling knots in timber, glow brightly. The Lulav Hut is motivated by a desire to created a simple, effective, and inspiring shelter out of lightweight, off-the-shelf, recyclable materials. Lulav, a closed frond of the date palm tree, hadass (myrtle), aravah (willow), and etrog (citron). 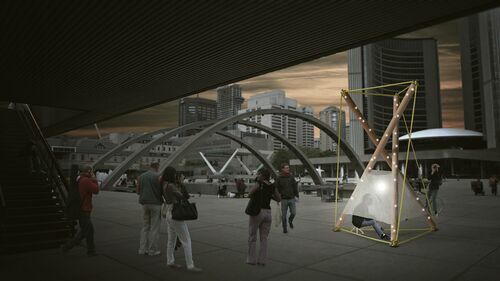 The traditional Four Species used during the Jewish holiday of Sukkot, metaphorically expressed by the 3 strut tensegrity with central light source. By Max Yuristy. Lulav Hut, a 3 strut tensegrity structure, elevation views. By Max Yuristy. Lulav Hut rendered by Max Yuristy. Annotated plan view of the Lulav Hut. By Max Yuristy. 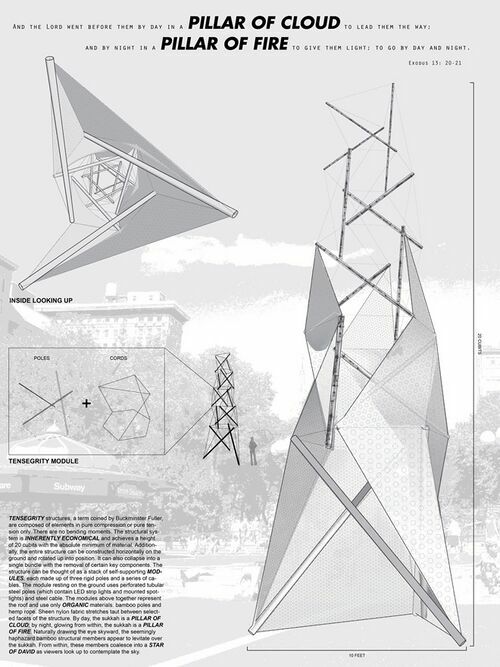 Andrew Sternad and John Kleinschmidt proposed the tensegrity design below for a tensegrity mast. 3 strut modules are stacked, one atop the other, to form a mast of five modules. The authors wrote: The structural system is inherently economical and achieves a height of 20 cubits with the absolute minimum of material. Additionally, the entire structure can be constructed horizontally on the ground and rotated up into position. It can also collapse into a single bundle with the removal of certain key components. The structure can be thought of as a stack of self-supporting modules, each made up of three rigid poles and a series of cables. The module resting on the ground uses perforated tubular steel poles (which contain LED strip lights and mounted spotlights) and steel cable. The modules above together represent the roof and use only organic materials: bamboo poles and hemp rope. Sheen nylon fabric stretches taut between selected facets of the structure. By day, the sukkah is a PILLAR OF CLOUD; by night, glowing from within, the sukkah is a PILLAR OF FIRE. Naturally drawing the eye skyward, the seemingly haphazard bamboo structural members appear to levitate over the sukkah. From within, these members coalesce into a "Star of David" as viewers look up to contemplate the sky. Pillar of Fire Sukkah, by Sternad and Kleinschmidt. The sukkah is conceived as a simple kit-of-parts easily transported by a single person. Using the principles of tensegrity allows for a light weight structure that offers adequate space for rest, feast and contemplation. The net that wraps the structure creates a soft veil, transparent enough to create a sense of being. One enters the sukkah by lifting one corner of the net. At the top, the net dips down to become the carrier of branches and leaves offering shade and a natural touch. The seemingly magic organization of forces in space gives the sukkah a cosmic atmosphere. 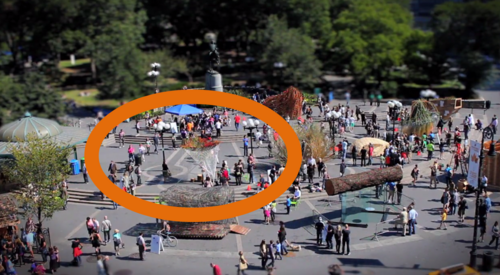 The In Tention Sukkah is seen in Union Square, New York City, 2010, in this video frame. Video by Forward Magazine. This page was last edited on 24 November 2018, at 16:24.